The ESSA has been difficult for most of us to interpret—although it is clear the U.S. Department of Education will now back out of a lot of school business. Still, in reading how the states will now be almost completely in charge, one wonders how NCLB will change. 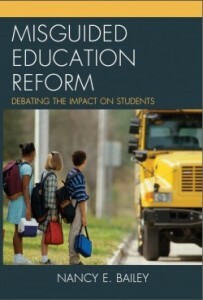 How many of us have states that will drop the draconian school reforms started under NCLB? Sen. Lamar Alexander (R-TN) and Diane Ravitch, the well-known educational historian, recently got together to help us understand the meaning of the new Act. I provide the link to their discussion at the end of my post. Their description under testing tells of the troubles surrounding NCLB. Like in Fort Myers which gave 160 tests in one year preparing for the NCLB testing. While states now have flexibility to be different, and do their own thing, I am concerned that most of us live in states that won’t change. Or they will change towards more privatization involving online schools and testing. State Governors helped to bring us Common Core State Standards, along with Partnership for Assessment of Readiness for College and Career (PARCC) and Smarter Balanced testing, online no less (ask Tennessee Governor Haslam how that went down last week). It looks like testing will now change to be continuous using technology with Competency-Based Education. While this is different from past testing, it is no less troubling. It is, in fact, more of a concern because it will mean a changeover from teacher-led instruction to putting most instruction on the computer with continuous online assessment. Yet online schooling is unproven in its worth. Instead: It is too bad the ESSA didn’t make it law that there be no more high-stakes testing, and that any assessment of a standardized nature would not take place until at least at the end of third grade. And teachers and parents in their local school districts should have been given the choice to choose the kind of testing that would be done. One test per year or one test every three years would have been sufficient. The law could have also put stipulations on the funding and use of online instruction—ensuring that it be used prudently and be fairly evaluated. There is no proof that this type of schooling and/or testing is ready for an all-out takeover of our public schools! The way the ESSA and teacher evaluation is described sounds just like testing. It states concerns about the use of testing—even notes that the American Statistical Association is against it. But once again, states can still use test scores to evaluate teachers. How many states will discontinue using high-stakes testing to brand teachers and get rid of them in favor of fast-track Teach for America or Residency teachers? Instead: The ESSA should have insisted that it be a qualified principal’s responsibility to evaluate teachers based on a variety of factors the local school board chooses as relevant. There was nothing wrong with the way this was done in the past. The principal should also be required to have been a career teacher for several years and get special university instruction in administration and supervision. In my opinion, parents too, should have the right to evaluate their student’s teachers. ESSA doesn’t make states close the schools in the 5 percent category and there is a 3 year extension of when they must consider how schools are doing. Ravitch and Alexander make it clear there will always be schools at the bottom 5 percent. But the Secretary of Education will have no say over what the states do when it comes to these schools. However, once again if states choose to keep the existing types of sanctions, they can. My guess is that many will continue to do what they have done in the past. The drive everywhere is to open more charter schools by closing those schools that are continuously in the bottom 5%, even though charter schools have been shown in general not to do better. How does this change what was done under NCLB? See Charter Schools below. Instead: The ESSA should have insisted the schools in the bottom 5% get assistance. These schools often have crummy buildings and a lack of resources and teacher support. Bolstering morale and financial support of the teachers in those schools is what’s needed. Any grant giving should focus on rundown schools and the problems children face in their community. It is our hope that as tests and the high stakes associated with an unthinking, punitive accountability system as in NCLB become less significant, the pressure and stresses associated with the tests will diminish, and the time spent on testing and test prep will drop. And states can develop new, more innovative testing systems under the new law, if they choose. We’ve also clarified within the new law that states can choose to have opt-out policies for all of the tests they administer if they would like. Nothing prohibits them from creating these policies. That sounds well and good, but how many states will create policies for opting out? Thus far it is murky. Parents I know will opt their child out of the test if they so desire disregarding any rules. States might punish schools by withholding funds, but how many states are telling parents to feel free to opt out? Seminole County Florida seems open to it if a certain type of protocol is followed. I highlighted the sentence about the states developing new innovative testing systems. This sounds very much like online, ongoing Competency-Based Education. This is worrisome. Instead. The ESSA should have cut the number of tests students are permitted to take. No child in kindergarten through second grade should be subjected to draconian testing. Teachers should be allowed to test students with a variety of assessments of their choosing. Civil rights and certain disability activist groups should not dictate how many tests or who should take what test. That should be a local school district decision with involvement and feedback from parents and teachers. If parents want more testing perhaps it could be available, or they should get it outside of public schooling. This Bill should have deconstructed draconian high-stakes testing, instead it handed it back to the states which will more than likely continue to carry out the harmful rules of NCLB. There are many groups pushing students with disabilities to get regular everything including tests. This creates a one-size-fits-all curriculum. In many ways it stigmatizes students who don’t do well in school and creates a slippery slope back to the terrible days of institutionalization. Today, look for substandard, segregated charter schools for students with special needs. While the law allows states to permit more than the cap of 1% of students to take an alternative assessment, my guess is most states will enforce the 1% cap rule. This will force many students with serious disabilities to take the test. We know that this is detrimental to those students and many parents do not want this cap. They also note that those with serious cognitive disabilities get different testing but that is unclear. Surely, assessment for those with developmental disabilities should be carefully outlined after the terrible use of testing in this area that we have seen in the past. The state legislators and education administrators want students to take regular tests so they can save money and rely on novices for teachers. Instead: School professionals including the school psychologist, special education teacher, regular education teacher, school counselor and district special education adviser, and significant others, should work with parents to determine which kind of assessments are necessary and should be required. The Individual Education Plan should rule! Teacher education is a serious issue at this time. It is stated that there is a teacher shortage in the country. Yet the Colleges of Education are becoming more and more insignificant as the reigns are handed over to groups like Relay Graduate School of Education mentioned in both the comments and in the ESSA Bill. ESSA does nothing to bolster the real schools of education. Instead it encourages the fly-by-night teacher education programs cropping up everywhere—many are online. There is little regulation as to how teachers are being prepared. Who’s teaching the teachers? I see no effort to shore up the real college teaching programs. Teach for America, The New Teacher Project and like groups win big here but these groups have not proven to be in the best interest of our students. Instead: The ESSA should have reestablished the university programs that provide real teaching coursework and class supervision. We should have honest people who have studied education pedagogy including the development of children working with future teachers. These individuals should also have experience working with students in real school settings to prepare the next generation of teachers. The explaining here is quite honest about Sen. Alexander being in favor of charter schools, but that doesn’t make me feel any better. As it stands, ESSA looks to be a giveaway to charter schools. And this is too bad since they are still selective, often harshly run, and unproven in their ability to raise test scores. While some stipulations are made about financial disclosure and transparency, if you read this section carefully it once again leaves everything up to the states. States who want to add charter schools will add charters. Instead: I wish ESSA would have instituted a nationwide cap on charters requiring an investigation into existing charter schools and/or any private school accepting public voucher funds. These schools need to be held accountable and be transparent to the public. They should not be allowed to automatically expel or reject students as many do. There are also grave concerns as to the punishing nature of many charter schools when it comes to discipline and the mistreatment of students. We should make sure charter schools are working well before creating any more. Since I am a public school advocate, I would also add that any well-working charter school should be pulled under the public school umbrella. Currently, we are creating a divided educational system, short of funding, where many schools, both charter and public, risk failing students. I quite honestly don’t think it changes the precepts of NCLB. Even the name the Every Student Succeeds Ace is similar to No Child Left Behind. I also don’t trust all the wordiness of the Bill. Its intent seems to be to confuse. Instead: The federal government could have created a new law that creatively restored a better vision for all of America’s children and their schools—one that relied on the voices of the people instead of on big business. It did none of that. ESSA instead took years to develop and in the end only pushed draconian reform on the doorsteps of the states. Whoever becomes the next Secretary of Education will be mostly powerless to affect good change in the states—even if they come from a President who sincerely wants to improve public schools. Ask yourselves, what has really changed. 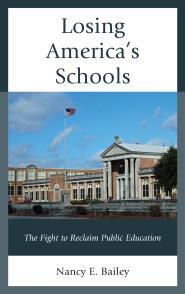 There is more reform leading to the privatization of America’s schools. And it will be in the form of total Competency-Based online instruction. Under ESSA, state standards have to be aligned so that the end point of the state standards in k-12 is aligned with the entrance requirements for the public system of higher education and career and technical state standards. This seemed like a logical requirement: students and parents expect that when the student leaves high school, the student is then prepared to go on to higher education or career and technical education. This bill may try to make it look like Common Core is in trouble and now at the mercy of the states. I find this strange! Implying that states can choose whether they will do Common Core when the Governors of almost all of those states signed on to Common Core from the start is misleading. Watch for Common Core to move into the realm of online instruction and testing—maybe it will be called another name to try to fool the people—like in Florida and some other places. Instead: The new bill should have brought in a variety of experts who have spoken out against Common Core to review the opposition. Since so much funding has gone into this albatross it is difficult to know how to fix it at the district level. But the ESSA bill should have involved returning the power of decision-making when it comes to local school districts to the American people. It should have at least raised serious questions as to why corporations are now funding public schools and dictating to parents and educators how their schools will be run—and with Common Core—what children should learn. In my opinion the Every Student Succeeds Act is rewarmed No Child Left Behind leftovers. Even the titles sound similar.It didn’t taste good before and it’s still just as bitter! ESSA Explainer. Network for Public Education Action. February 17, 2016. Nancy, the problem behind it all is that we need to reset, much like computers, start over…. Of course this is hard with millions of kids in school. So the way to start is: 1) redefine teacher education and bet the money on the teachers (we’re throwing so much money away!). This means: do away with remedial degrees, select candidates from the smartest, highest performing applicants, pay teachers top salaries (teachers’ reputations should be much higher than hedge fund managers!!!) 2) give children creative time, FREE time, and LISTEN to their needs without tests, lexile measures, etc., and 3) start rethinking our common goal as a country.. If our world view is such that happiness = success = productivity = products & playtime = laziness = empty hands, then by all means let’s keep heading to 1984. But if we think playtime is a time for joy, exploration, and sharing, leading to creativity, which turns to productivity not just in a material sense, then it’s time to stop fighting over minutiae and take a leap towards a fuller tomorrow. I agree with much of what you say, Romina. But starting over–I think some things we were once doing quite well and tweaking was in order. But of course all the rest of what you say I am on board! Thank you! Excellent, Sheila! Also your point about their co-opting words of the Civil Rights Movement–they did that in special education too. Now we see fewer SPED programs–driving many parents to home school. Thank you for sharing. I’m afraid the plan is for all CBE. ESSA makes it look that way.